Submitted Photo Pictured are some of the attendees at a recent meeting of the National Society of the Daughters of the American Revolution – Benjamin Prescott Chapter. Pictured in the first row from left are: Antoniette Sherman and Birthday Girl Julina Harris. Second row from left: guest Lois Sanderson, Mercy Warren, Roxanne Wood, Phyllis Noble, Lisa Sedlmayer and Carol Abell. WESTFIELD — A regular meeting of the Benjamin Prescott Chapter of The National Society of the Daughters of the American Revolution was held at the McClurg Mansion in Westfield on April 5 at 1 p.m. In the absence of both the Regent and Vice Regent, the opening ritual was performed by Antoniette Sherman and Lisa Sedlmayer. Sedlmayer read the DAR President’s Message and Barbara Pietro read the DAR National Defense Article. In the secretary’s absence, acting Secretary Carol Abell read the minutes from the previous meeting and the treasurer’s report is held until next month, as the treasurer is also away. The report from Dawn Ubaney, Registrar stated that one new application was sent to Washington, D.C.
Roxanne Wood presented a ‘Thank You” from SSG Harry Shoemaker in recognition of the packages the Chapter sent to the troops in Afghanistan. They especially enjoyed the potato chips and chocolate chip cookies. The Chapter is already planning for its 120th anniversary next year and many members are planning to attend the District VIII meeting April 28. In June, members go to the Continental Congress in Washington, D.C. The possibility of marching in the Independence Day Parade in Mayville this year was discussed. Pietro has some ideas for costumes. A busy year is planned! After the meeting a celebration of Julina Harris’ 85th birthday that was enjoyed by all was hosted by Pietro. 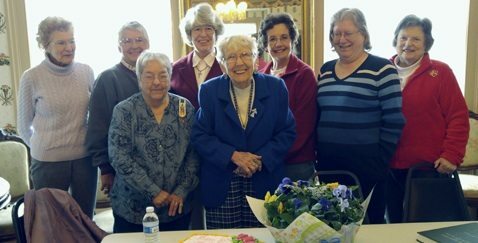 The honoree was presented with a beautifully decorated cake and a flowering plant. The next meeting will be May 3 at 1 p.m. at the McClurg Mansion in Westfield. If you had an ancestor that fought for freedom in the Revolutionary War and would like to join us, call Dawn Ubaney at 679-1218.